Washington, DC, March 28, 2006 - The Central Intelligence Agency and National Reconnaissance Office used the nation's spy satellites and spy planes to obtain high-resolution images of the nuclear facilities of allies, adversaries and neutral nations alike, as illustrated in a collection of overhead reconnaissance images posted on the Web today by the National Security Archive. Today's posting includes 15 photographs and five photographic interpretation reports from the 1950s, 1960s, and 1970s. The images were obtained by U-2 spy planes and CORONA and KH-7 reconnaissance satellites. The interpretation reports were produced by the CIA's Photographic Intelligence Center as well as its Imagery Analysis Division and the National Photographic Interpretation Center. 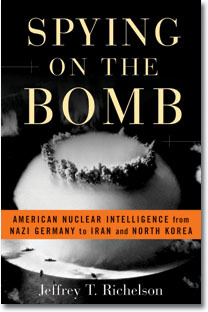 All but two of the images were obtained for use in the book, Spying on the Bomb: American Nuclear Intelligence from Nazi Germany to Iran and North Korea (W.W. Norton, 2006), by Archive Senior Fellow Jeffrey T. Richelson. Two additional images were obtained exclusively for this briefing book. All the photos were located and extracted from the extensive collections of U-2 and satellite imagery in the National Archives by Tim Brown of Talent-Keyhole.com. Many had never been extracted from the Archives' holdings before - including overhead images of French and Indian nuclear facilities. The images and photographic interpretation reports illustrate the variety of nuclear installations targeted by these programs -- ranging from uranium mining facilities to nuclear tests sites and the installations used to convert the mined material into testable weapons -- as well as the growing capabilities U.S. overhead reconnaissance systems. But the U.S. would soon have a new, and in some ways better, means of monitoring developments in the Soviet interior. August 19, 1960, marked the first successful completion of a CORONA mission - CORONA being the codename for the satellite reconnaissance program that President Eisenhower had assigned responsibility for to the CIA in April 1958. At that time and for a number of years thereafter, "successful completion" meant that the satellite-borne cameras had successfully photographed their targets and that the film capsule carrying those photographs had been ejected and recovered in the air or at sea by a special recovery squadron based in Hawaii. The pictures they initially recovered did not have nearly the clarity and definition of U-2 images - instead of resolution of six inches or a few feet, the initial pictures had a resolution of 40 feet. But as CORONA satellites carried more advanced camera systems, that resolution improved to six feet for the final camera system (the KH-4B) carried on the CORONA satellites. There were also improvements in the quantity of film carried, which translated into longer lifetimes and more targets photographed. The characteristics of the different camera systems carried on CORONA satellites is given in Table 1. The final CORONA mission was launched on May 25, 1972. By that time another satellite program first authorized by President Eisenhower had achieved success. In 1960, Eisenhower had given the Air Force permission to go ahead with a program designated GAMBIT. Whereas CORONA was a search satellite whose mission was to produce photographs that showed thousands of square miles in a single photograph, GAMBIT was designed to photograph much narrower swaths of the earth (only about 120 square nautical miles) but with far greater resolution. The improved resolution would translate into an ability to produce better technical intelligence about military facilities, including nuclear facilities and weapons systems. In July 1963, the first GAMBIT satellite was launched, carrying the KH-7 camera system. In 1966, the first of a new generation of GAMBIT satellites would be launched with a new camera system that would completely supplant the KH-7 system after the final mission of June 1967. The camera system for the new generation, the KH-8, would commonly produce images with a resolution of six inches - and on occasion far better. While all KH-7 imagery, other than that of Israel, was declassified in September 2002, no KH-8 imagery has been declassified. All CORONA imagery was declassified in 1995 and is available at the National Archives and Records Administration II facility in College Park, Maryland. All U-2 imagery is also available at NARA II. 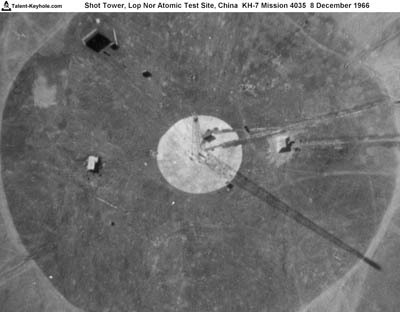 Soviet and Chinese nuclear facilities were the most important targets of U.S. aerial and satellite imagery between 1960 and 1972 and for a number of years beyond. But these were by no means the only nuclear facilities photographed by U-2 spy planes or the CORONA and KH-7 satellites. During that period, the nuclear facilities of France, India, Israel and Taiwan were also targets of U.S. overhead reconnaissance activities. Specific targets included nuclear weapons design laboratories, uranium mining facilities, uranium enrichment and plutonium production plants, nuclear reactors, and nuclear test sites. The images presented below represent some examples of the images obtained between 1960 and 1972. The photographs were located and extracted from the reels of film held at NARA II by Tim Brown of Talent-Keyhole.com. Two of these (Image 5 and Image 14) were obtained specifically for this briefing book, while the others were collected as part of the research behind the new book, Spying on the Bomb: American Nuclear Intelligence from Nazi German to Iran and North Korea, by National Security Archive Senior Fellow Jeffrey T. Richelson. (Note 7) In addition to the images, some of the photo interpretation reports for the target facilities are included in this briefing book. Source: CIA Records Search Tool (CREST), National Archives and Records Administration (NARA) II, College Park, Maryland. This report, based on U-2 and ground photography, refugee sources, clandestine reports, and open literature, covers the geology, the mines and mining activities, and primary processing at the mines and at the primary processing plant. The Explosive Test Cell at Arzamas-16 for testing high-explosives to be used in nuclear warheads, as photographed on February 5, 1960, during U-2 Mission 8009. Document 2: National Photographic Interpretation Center, Central Intelligence Agency. Ancilliary Facilities, Utilities, and Transportation Networks, Kyshtym, Atomic Energy Complex, USSR, March 1964. Top Secret. Source: CREST, NARA II, College Park, Maryland. This photographic interpretation report, updates two previous reports on the same subjects, prepared before KH-7 imagery became available. The "excellent quality" of the KH-7 imagery provided "details not previously discernible" and permitted "an analysis of changes which have occurred in the ancillary facilities." The facilities covered in the report include the waste processing facility, a probable fabrication facility, administration and service area. The report also covers electric power utilities and transportation facilities. Document 3: National Photographic Interpretation Center, Central Intelligence Agency. Kyshtym Atomic Energy Complex, USSR. July 1964. Top Secret. Source; CREST, NARA II, College Park, Maryland. This report, focusing on the three reactor areas at Kyshtym, the chemical processing area, and the Tatysh Production Area, updates reports completed in October, November and December 1963, and January, February and March 1964. There were six KH-7 missions from late October 1963 through June 1964, including two after March 1964. "Extensive refinements" of previous evaluations were possible, according to the report (p.1), based on the KH-7 imagery. Document 4: National Photographic Interpretation Center, Probable Atomic Energy Complex Under Construction Near Chih-Chin-Hsia, China, [Deleted], August 1964. Top Secret. (see Image 8) was referred to a Chih-Chin-Hsia. This report indicates the progression of knowledge about the Chinese program. The summary (p.1) notes that when earlier reports were prepared "the nuclear implications of the complex were considered to be only suspect" while "later photography ... indicates that is a probable atomic energy complex ..." The report addresses the areas responsible for production, construction support and storage. It covers the workshop area, the main housing area, and the clay pit area. It also contains a comparison with other installations, including Baotou (see Image 10) and Kyshtym (see Document 3). Document 5: Imagery Analysis Division, Central Intelligence Agency. Reactor Buildings, Kyshtym and Tomsk Atomic Energy Complexes, USSR, date not legible, Top Secret. Internal evidence suggests that this report was produced in1964 and was thus able to incorporate imagery produced from several KH-7 missions. The report, as released, consists largely of photographs and drawings based on the overhead photography. The Tomsk-7 nuclear facility, as photographed on January 24, 1966 during KH-7 mission January 24, 1966. A close-up of the entrance to the test shafts at Mururoa, as photographed by a KH-7/ GAMBIT satellite on May 26, 1967. Image 9: Jiuquan Atomic Energy Complex, China. Image 10: Lop Nur Nuclear Test Site, China. After an extensive search that began in August 1958, Chinese authorities selected a site in northwestern China - known as Lop Nur - to test China's nuclear weapons. The first was tested on October 16, 1964. This shot tower, which would hold a test device, was photographed on December 8, 1966, during a KH-7/GAMBIT mission. A test occurred on December 28, 1966. The Baotou Nuclear Fuel Component Plant in central China, as photographed on June 5, 1967 during KH-7/GAMBIT Mission 4038. The plant produced uranium tetraflouride, which would be converted into uranium hexalfluoride and used to produce enriched uranium. At first, the U.S. Intelligence Community believed that Baotou was home to a plutonium production facility. Image 12: Marcoule Plutonium Production Plant, France. 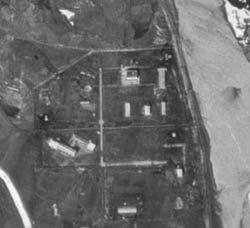 The Marcoule Plutonium Production Plant, France, as photographed on June 11, 1967 by a KH-7/GAMBIT satellite during Mission 4038. The plant, designated G-1, went critical on January 7, 1956, and reached full power in September. 1. Chris Pocock, Dragon Lady: The History of the U-2 Spyplane (Shrewsbury, England: Airlife, 1989), p27; Gregory W. Pedlow and Donald Welzenbach, The Central Intelligence Agency and Overhead Reconnaissance: The U-2 and OXCART Programs, 1954-1974 (Washington, D.C.: Central Intelligence Agency, 1992), pp. 104-105. 2. Jeffrey T. Richelson, The Wizards of Langley: Inside the CIA's Directorate of Science and Technology (Boulder, Co.: Westview, 2001), p. 13. 4. Derived from Dwayne A. Day, John M. Lodgson, and Brain Latell (eds. ), Eye in the Sky: The Story of the Corona Spy Satellites (Washington, D.C.: Smithsonian, 1998), pp. 231-233. 5. National Imagery and Mapping Agency, America's Eyes: What We Were Seeing (Bethesda, Md. : NIMA, 2002), pp. 2-3. 6. Jeffrey T. Richelson, "A 'Rifle' in Space," Air Force Magazine, June 2003, pp. 72-75. 7. Jeffrey T. Richelson, Spying on the Bomb: American Nuclear Intelligence from Nazi Germany to Iran and North Korea (New York: W.W. Norton, 2006). 1. Jeffrey T. Richelson, Spying on the Bomb: American Nuclear Intelligence from Nazi Germany to Iran and North Korea (New York: W.W. Norton, 2006, pp. 116-119). 4. William Burr and Jeffrey T. Richelson, "Whether to 'Strangle the Baby in the Cradle': The United States and the Chinese Nuclear Program, 1960-1964," International Security, 25, 3 (Winter 2000/01), pp. 54-99. 5. Richelson, Spying on the Bomb, pp. 190-191. 6. Burr and Richelson, "Whether to Strangle the Baby in the Cradle'." 7. Director of Central Intelligence, SNIE 22-2-63, The French Nuclear Weapons Program, July 24, 1963, pp. i, 4-5. 8. Richelson, Spying on the Bomb, p. 330. 9. See Avner Cohen, Israel and the Bomb (New York: Columbia University Press, 1998).